Loy Krathong Festival has several customs and traditions that attract tourists from all over every year. One such attraction is the floating lanterns and floating flower baskets. The name "Loy Krathong" roughly translated means "to float a basket". The custom of floating baskets comes from Krathong, where adorned baskets are released into a river to float away as an attempt to pay respects to the water spirits. This festival has several other tourist attractions such as holding beauty pageants. During the time of this festival, all local homes, commercial and government buildings and temples and shrines are decorated with beautiful and colorful lanterns. 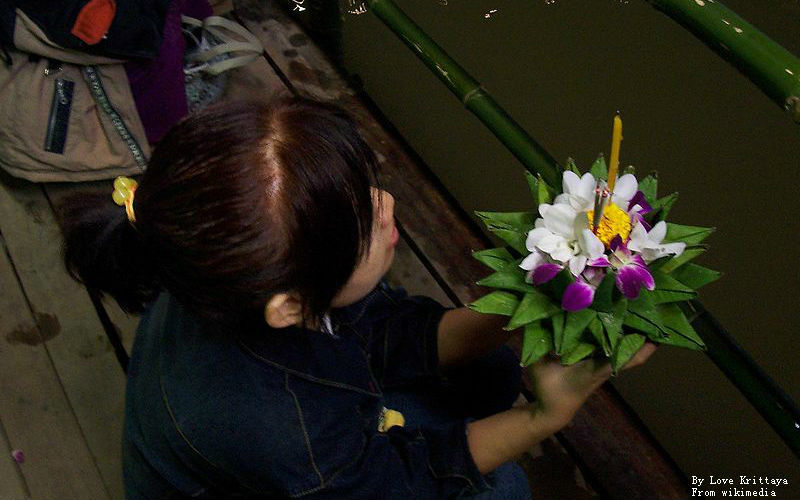 A Krathong is a small floating basket that's made especially to carry out this floating custom. It measures roughly 20 centimeters in length and is made out of leaves and wood that came from a banana tree. Beautiful flowers adorn this basket which includes a candle and incense sticks. The locals put personal items such as a small coin, a lock of their hair or their nail clippings in it as well. When the full moon is rising, people taking a part in this ritual light the candle and the incense sticks and say a prayer before floating their basket down the water. Khom Loys, which are sky lanterns are thought to ward off bad fortune when they are lit and flown away in the sky. 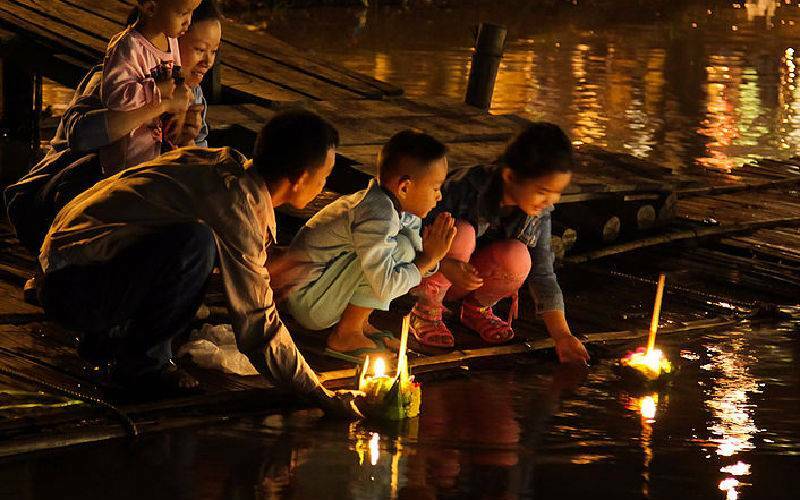 When the Krathongs are floating down the river with their lighted candles, the Khom Loys are drifting into the sky, making it a beautiful sight for all that are present to witness this spectacle. Constant fireworks add to the beauty of this scene. That's not all. After the baskets are floated down the water and the Khom Loys floated into the sky, you are going to see several little boys diving into the water to collect the coins placed in the krathong. The entire scene is epic. The history of this festival in Lanna (also known as Chiang Mai) can be dated back to the time after King Rama V's Queen named Dara Rasami (who was originally from Chiang Mai) had come back from Bangkok to Chiang Mai. On her entry, she floated a beautiful flower basket that is a Krathong to the Ping River, ever since it has become a popular ritual amongst the locals of Chiang Mai. It gained further momentum and popularity after it was promoted by the Chiang Mai governor for the promotion of tourism to this region. With the passage of time activities such as beauty pageants and the Krathong Parade added to the popularity of this festival. Why Thais release floating baskets? There are two main reasons behind the Thai observing the Krathong ritual. Both reasons have a religious purpose. The candle that is lit in the basket is considered to be symbolic of the light that Buddha brought to the world with his teachings, whereas floating the flower basket with a lit candle down the water is thought to free the worshippers of the sins committed in the previous year. The later is also thought to ward off bad fortune for the times to come. The locals believe that floating a flower basket alone does not bring them a good fortune; instead, they must place an item of personal belonging inside the basket. As aforementioned it could be a coin, locks of hair or nail clippings. Placing coins, hair and nails are thought to be a way of making merit and washing away the sins committed in the past year. It is also believed that if your flower basket floats down the river, away from you then the coming year is going to bring you lots of good luck and fortune. In case it does not float down the river but instead floats back towards you then the coming year might not be as lucky for you as you were hoping it to be. Young couples and lovers also say a prayer and wish for togetherness and happiness as they float the Krathong away into the river. If you are visiting Thailand around the time of this festival then you can take part in it too. It does not matter if you were not creative enough to make a Krathong yourself. After sunset, you are going to find alongside the streets countless stalls selling beautiful readymade krathong. They are not only beautiful to look at because of the fresh flowers but they also contain the candles and the incense sticks. These mini floats are thought to promote good luck and fortune, and you are supposed to take them down to the river or a lake closest to you. 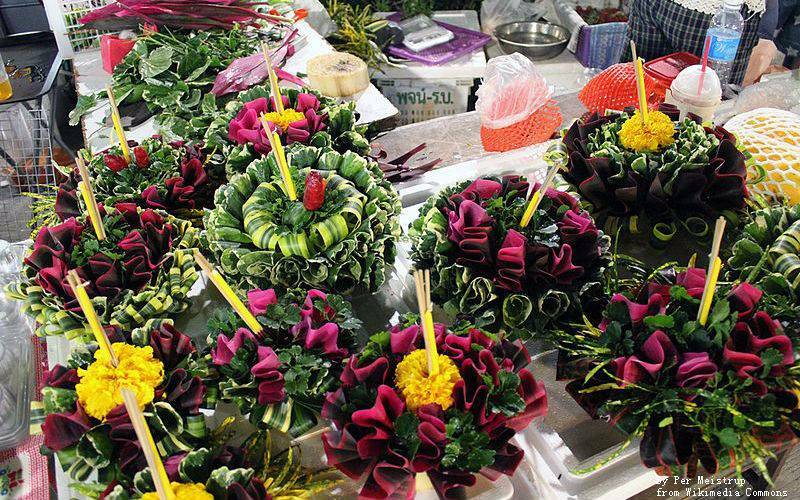 Here's a step by step guide of what to do after you have purchased a Krathong. First of all find a suitable beach or a lake nearby. Go to the respective area after sunset when the moon is rising. You are going to see lots of locals gathered there already for the celebration of this popular Thai festival. The next step is to put locks of your hair, your nail clippings or coins into the Krathong. The next step is to light the candle and the incense sticks that came with the Krathong. The whole family should be holding the Krathong and make a wish together. After making a wish give a gentle push to the Krathong into the running water. The current will carry it away and as per the Thai belief carry away your troubles with it as well. Don't like the readymade Krathong? You think you could do a better job at making one yourself? Well, the good news for such creative souls is that the Krathong is not much hard to make. The floating is made up of leaves and wood from a banana tree. These are crisscrossed together. Flowers of choice can be added to them along with incense sticks and candles. It is just a matter of how creative you are. Different flowers are supposed to be symbolic of different things. For example, the marigolds are symbolized to bring prosperity. If these two still cannot meet your requirements, we also provide tailor-made service based on your requests. Feel free to contact our local travel consultants. Free of charge. Click: Design My Thailand Tour Now!